.......and our umbrella expands in the summer to include interns! There are many ways Hobbs gives back to the community throughout the year, and one of our favorite things to do is invest in young people through our summer college internship program. We understand that working with, training, and exposing these young people to our behind-the-scenes hard work is an important part of developing qualified people for the hospitality industry. What a privilege to be part of someone's career training and life decisions! 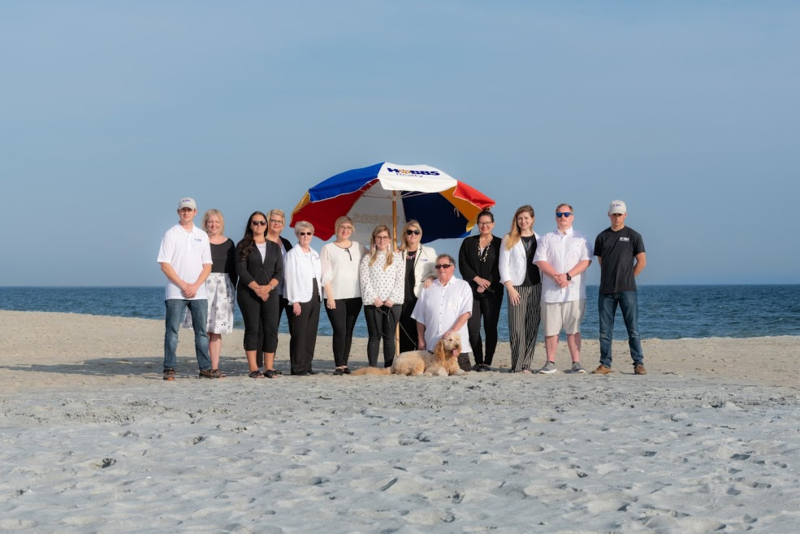 One of our recent college interns, Claire, shared that her experience with Hobbs Realty was everything she expected and more, saying she learned so much about the vacation rental management industry over the course of three months. She assisted with a wide variety of responsibilities in guest services, the housekeeping department, and with the administrative team. There was certainly no rest for the weary on the wild and crazy Saturdays when the rental homes are cleaned in between check-ins and check-outs. Preparing for the housekeepers and helping to ensure the homes were to Hobbs standards were among Claire's weekly top priorities. "I had no idea that there were so many components of this business until I arrived at Hobbs," Claire described. "I learned that the management company is running the whole show for each house. They schedule weekly cleanings, manage [and help maintain] the property through work orders, and ensure everything is in tip-top shape for the guests." Not only did she learn about how a rental management firm takes an incredible load off the homeowners and the many aspects involved in managing rental homes, but Claire's summer internship with Hobbs also affirmed her desire to choose property management as a career after she graduates from UNC-Chapel Hill. "I am very interested in managing rental houses in the near future or even getting my real-estate license," she said. Claire appreciates that Hobbs Realty is family-oriented. "The culture and philosophy of Hobbs is a great representation of how much Hobbs Realty actually cares for their guests. They will always go the extra mile and smile to make the guests and property owners happy.... They are always transparent with the guests and provide great services to everyone, no matter what." Enjoying sunny days and the incredible view were certainly perks of Holden Beach living for Claire, but she was honest about how hard she worked! Although she started out not knowing all the answers or how to do everything, she was amazed at the at how much she grew in knowledge and professionalism through the summer, landing her in a place of confidence and feeling satisfied. Claire learned about customer service, communications, work orders, housekeeping, organization, office software and systems, and the details of rental home management. While Hobbs Realty makes property management look easy, it often entails long hours and attention to detail. Gratefully, the Hobbs team is able to streamline many of the repetitive tasks with highly automated systems and a great team! Claire's summer may have included some long, tiring Saturdays, but she completed her busy summer fulfilled with knowing it was a job well done... and Hobbs Realty certainly gained another special friend.